A superb Detached Bungalow in this sought after cul de sac location, benefits include far reaching rural views to the rear, enclosed and well stocked gardens, garage, car port and driveway parking for a number of vehicles.Being offered for sale with vacant possession and no forward chain this home is in excellent order throughout and must be viewed to fully appreciate all that it has to offer ! DESCRIPTION This wonderful home is accessed via a door to the side aspect and leads into the spacious, light and airy Sitting/Dining Room which has a polished stone fireplace with inset remote control gas fire, radiator, television point, fitted cupboard units to the dining area. There is plenty of space for a dining table and chairs and a doorway gives access into the Kitchen. Being fitted with a modern range of wall and floor mounted cupboard and drawer units, work surfaces incorporating a single stainless steel sink and drainer unit with a mixer tap, integrated oven and electric hob with a brushed steel extractor hood above, space for an upright fridge/freezer. There is an oak flooring and a door and window to the side aspect. There is a large Conservatory which is of UPVC and glazed construction under a polycarbonate roof .It has sliding patio doors that lead from the sitting room, power and a radiator and two access doors that lead into the garden. 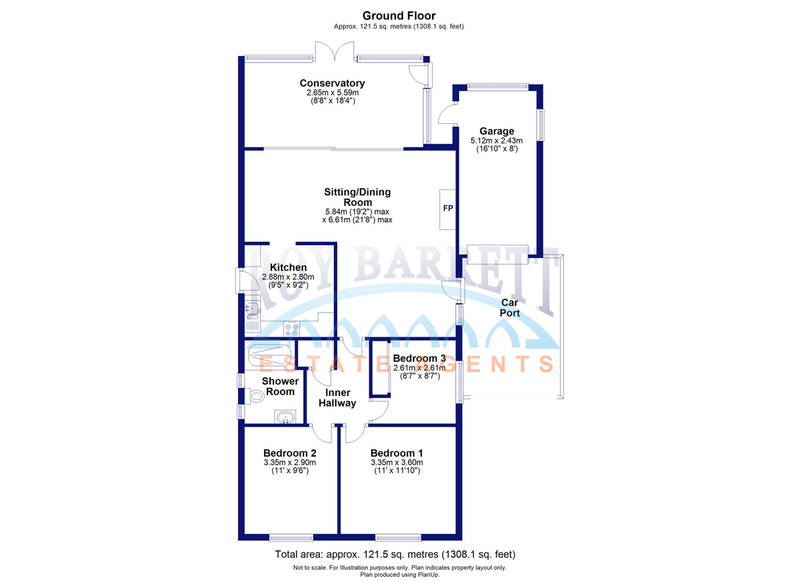 The Inner Lobby has a cupboard with space and plumbing for the washing machine, a loft access and doors lead to all further rooms including a spacious, light and airy Master Bedroom with a double glazed window to the front aspect, a radiator and television point. Bedroom Two is another generous double bedroom with a radiator and double glazed window to the front aspect. The Third Bedroom is a good sized single room with a window to the side aspect, radiator and fitted cupboards with sliding oak doors. A Modern Shower Room is fitted with a walk in shower cubicle with a screen, and spa shower with deluge head and fitted hand held shower attachment, low level w.c and a ceramic wash hand basin is fitted into a vanity unit, there is a shaver point , heated towel rail and two double glazed obscured glass windows to the side aspect. OUTSIDE The front of the property is accessed via a driveway which offers parking for a number of vehicles and leads via a Car Port to the Single Garage which has power and lighting, up and over door to the front and a pedestrian door to the rear (this would be ideal for conversion into another room subject to the relevant permissions) Along side the drive is the front garden which is laid to lawn with a variety of beds and borders with shrubs and bushes. Side pedestrian, timber gates offer access to both sides of the bungalow and lead to the Rear Gardens which are a particular feature of this home , with a lovely paved sun terrace/patio and a feature circular, raised flower bed with steps down to the lawned garden which has a number of flowering shrubs and trees, arch trellis with climbing shrubs, 2 timber sheds and a timber summerhouse which has a cloakroom area, outside tap. There is a raised, decked seating area at the bottom of the garden where you can sit and while away the hours enjoying the wonderful far reaching rural views. LOCATION Marnhull is a sought after village located in the heart of the Blackmore Vale offering a Post Office, 2 stores, chemist, butchers, newsagent, hairdressers, garage, inn, doctors surgery, churches, schools and bus services. Marnhull is also celebrated in Thomas Hardy&146;s Tess of the D&146;Urbervilles as Marlot. The old market town of Sturminster Newton is 3 miles distant which offers a good range of every day facilities, Gillingham has the main line railway station (Exeter / Waterloo) is approximately 6 miles distant, the Georgian market town of Blandford Forum 13 miles, county town of Dorchester 22 miles and the Dorset coast approximately 26 miles.